One of The Legal Genealogist‘s standard recommendations to folks heading out on research trips is to tuck a copy of the state’s records access laws into their research bags, in case they encounter a clerk or other official who hasn’t read it lately. Then, when the clerk or official starts to say no to a request for access to records, the researcher can pull it out and — gently and politely and never ever confrontationally — ask the official to point out where in the law it says that this particular record can’t be accessed. This isn’t for those times when the clerk says that the records can only be seen on Thursday afternoons from 1-4 p.m. or that there’s a fee for copying the records or that you have to wear white gloves (or can’t wear white gloves) when you handle the records. Those are all time, place and manner restrictions that may very well be within the official’s discretion. So… where do you find the state’s records access laws to tuck into your research bag to take with you? 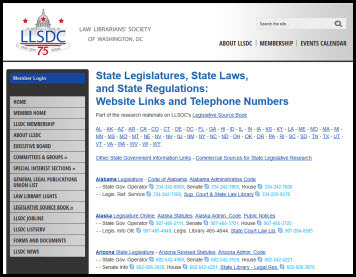 Modern state law research can always start here: the State Legislatures links page of the Law Librarians’ Society of Washington, D.C. This absolute gem of a website with its Legislative Source Book has a ton of information about legislative research resources, but this one page is what we need here: it pulls together all of the websites for all of the state legislatures across the country, with links directly to the state statutes and state administrative rules for each state. When you land on the website for the state of interest, by clicking on a link for its code or statutes or laws (the terms are interchangeable), you will need to search for the access law, and there you may need to be a little creative. And remember that you may need to use the advance search features of the legislative website if it offers them so that you can do what’s called boolean searching — where you search for one word within a certain distance of another. Just another way that knowing the law makes us better — and more effective — genealogists. Got this one tucked into my folder of “Research hints”. Thanks Judy. Great idea to get around arbitrary blockages (even if well-meant). Another suggestion: in my days as a bureaucrat, I was happy to make and send copies of short documents to constituents. However, I was extremely busy, and it was unrealistic for me to search out and copy large FOIA requests. The head of my department agreed, and we met the request by making archived material available under supervision. It doesn’t hurt to ask. Very timely, as I recently had a go-round with the Litchfield, Ct. Court records clerk on this very subject. The problem was, the records were stored in an area that was not open to the public, but the clerk would find them for me and mail them. Of course, she was very busy and it may take a month or so. Six months later, I called for the sixth time, and this time stated that I would be there on Thursday morning at 10 am, and would she please be sure that the book I needed WAS in a public area, as I had a legal right to access. Hmm, I had my copies two days later. What about fees, I walked into a California research library in Santa Ana, and was told the fee to enter was $25.00 per day. I know research library’s need money, but that seemed a little high. I think I have mentioned this to you before, but not sure. I ran into a clerk in LaSalle Co., IL who told me that Naturalization records were not public records and that I could not see them. When I asked her to show me in the law where it says that those records are not public records, I was laughed at and very sternly told to get out. Now. She then turned around and went into an office. As far as paying for access, Woodford Co., IL used to charge $5.00 at the Clerk’s office to just get access to the registers. If you found anything, copying was extra (which I don’t mind paying for). But I thought the $5.00 fee to just look at the books a little out of line. I don’t know if they still do this, as I have not been there for quite a while. Thank you for this. It’s important that researchers understand the issue and don’t assume records custodians are just hoarding things for no reason (but also that where access is deserved it is given). Here at the Utah State Archives it’s a continuous task to help records managers understand the relevant statutes for access (keep in mind those assigned to work with records are often the newest or lowest paid employees). We have a page dedicated to federal and state code, local ordinances, and now even building up references to case law at http://archives.utah.gov/recordsmanagement/government-records-law.html. A great page, Gina! Thanks for posting the link! While catching up on my blog reading this afternoon, I came upon this post. How wonderful and timely. I was trying to get a trial transcript for my gr. uncle who had an insanity trial in 1877 in Doniphan County Kansas. I was told because it was insanity, it was confidential, and I would not be able to see it. I then asked about a time limit because it was over 130 yrs. old. She said, No – confidential was confidential, and it always would be. I have tried to look at the resources you listed which I greatly appreciate. Sadly, I found some that seem to indicate there is a 70 yr. limit but am not sure if I am reading it correctly or if it would apply to this situation. Also, I am not sure she would be receptive to information contrary to what she told me. I need to ask her next week for a trial transcript/information for a 1875 horse thief trial (grand larceny) and an 1870 slander trial in which my ancestor was awarded one penny in compensation! It is an interesting branch of my family. Thanks for all of the help, support and guidance you give family historians. Thanks for the kind words, and good luck in getting those records.